A weekly newspaper has celebrated the 20th anniversary of its website, believed to be one of the first to be set up in the regional press. The Hinckley Times site went live on 29 February 1996 featuring news, sport, features, ads and a ‘Who Are We’ section. 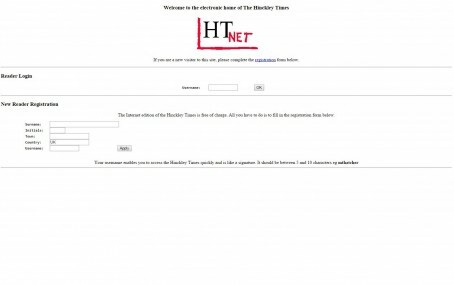 The website, then called HTnet, was founded at a time when just 30 million people had access to the internet, and a guide on how to use it featured in the paper as part of the launch. The site required readers to register for access, so no image of its home page currently exists, but the registration page features in a gallery showing the site’s evolution through the years marking the anniversary. In 1996, then-editor David Potter told readers: “The World Wide Web is an exciting new publishing medium and, as publishers, we cannot afford to ignore its vast potential. “Although we have no way of knowing how the Internet will evolve, we have no doubt that it is here to stay and will play an important role in the way information is made available in the future. During the site’s lifetime, the Times has come second in the Newspaper Society awards for best newspaper internet site. Current editor Simon Holden said: “From such small beginnings, we are now getting up to a million hits a month as well as nearly 200,000 unique users. He added: “Today our website is constantly updated and has a vast array of news, sport and features to read. Congratulations to The Hinkley Times for being so ahead of the game. And I remember when we launched the Reading Evening Post website in 1995. Pioneering times, and, as Simon says, such simple affairs looking back at them. Has it made any money yet? Well done Simon. Now tell us on HTFP how much ad income it makes compared with the paper. That would be interesting. Andy – what a wonderfully sneaky way of saying your egg came before the Hinckley Times’s chicken. Five hits a month from each user of which two at least will be home page landing points. If it was one story a day – just one story a day – it would be 12 million hits. Just saying – and a 5-1 ratio is pretty good for lots of sites. Good website and – when I get to see it – my home-town newspaper still feels like a proper local weekly ie one with plenty of local news in it. Believe it or not some regional press sites still look like this! There’s certainly no more ads on now than there were back then and you’d have hoped in 20 plus years someone would have come up with a way of monetising them, the fact no one has is a true reflection of their perceived worth to local regional businesses as a credible commercial viability. So, now we know who to blame…..
And still no mention of money made from digital Simon? Otherwise what we have is vanity publishing. I know the answer of course, just being puckish. very little HARD CASH out of digital. But they all know it in their boardrooms I bet. I should have added that unlike a lot of weekly rags that have gone regional rather than local this one still has decent local content. great stuff. People stopped using the word ‘hits’ to define the number of website visitors years ago. It really refers to the number of downloads of bits of info on a page. So you could easily have four ‘hits’ for one story, a picture, a caption etc etc. Unique visitors is a more accurate measure. Time per UV is the real measure if you want to measure engagement rather footfall. These questions about whether the website makes any money are missing the point. Do HTFP visitors think that if newspapers did not have websites everybody would still be reading the print versions? If so I’m afraid they are under a sad delusion. It’s a bit like John Lewis refusing to have anything to do with online sales because it wants to compel customers to go into its shops. They wouldn’t necessarily do so – they would shop on Amazon or elsewhere online instead. Newspapers are in fact paying the penalty for FAILING to embrace the Web ten to 15 years ago – in dodging so they handed their property advertising to sites like RightMove and their motoring advertising to Autotrader and the like. If newspapers want to have a future they should be looking at buying out RightMove, Autotrader and even Amazon – except that they now can’t afford to do so. Unique users is one measure of audience but far from the only one that should be taken into account. Pages per visit, frequency of visit and percentage of local audience penetration are equally important. To those who ask where the money is, you should take into account programmatic revenue, which is guaranteed revenue. The more pages you produce, the more money you earn. Granted, it’s not enough to fill the revenue gap caused by print revenue declining but, for the first time, there’s a direct link between editorial content and revenue gained. That’s a powerful – and empowering – message for journalists.